On Monday 25th July, The Sheridian Suite in Manchester hosted the first ever English Curry Awards aimed to recognise and reward the curry industry in its entire facet. Hosted by Jeff Mirza, it was no surprise that once again CHAK 89 was called up on to the stage as the winners of The Caterer of the Year Award for its achievements in the catering industry. 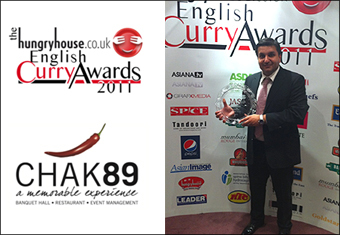 Shortlisted with 5 of the best caterers in England, Chak 89 are proud to be named as the English Curry Awards Caterer of the Year. Mr Frank Khalid relished the occasion with a speech in which he thanked the nominators, the judges and more importantly the public in having the faith and trust in Chak 89 and its services. 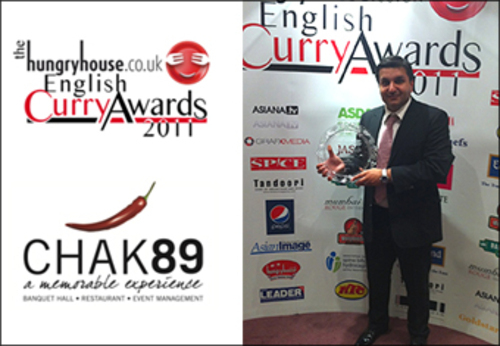 Providing fresh and quality cooked food for any event is a principle to Chak 89 and by delivering this principle Chak 89 has reaped the rewards by being voted English Curry Awards Caterer of the Year 2011 to sit alongside many other Awards won by Chak 89. Chak89 are not only the best Indian restaurant in London but they are perfect for all types of wedding celebrations and a great Indian wedding venue, they can accommodate and cater for up to 650 guests in two adjoining banquet halls. Also perfect for business conferences, or let us bring the CHAK89 experience to you by allowing our Indian caterers to stage your special day at any venue of your choice. This press release was distributed by ResponseSource Press Release Wire on behalf of Chak89 in the following categories: Men's Interest, Entertainment & Arts, Women's Interest & Beauty, Food & Drink, Retail & Fashion, for more information visit https://pressreleasewire.responsesource.com/about.